Young Anne by Persephone favourite Dorothy Whipple is one of the publishing house’s new titles for Spring 2018. First published in 1927, Young Anne is Whipple’s debut novel, and the final book of hers which Persephone will be printing, bringing as they have done all of her wonderful novels back into print. Whipple’s writing, as ever, is gloriously detailed. When, early in the book, Anne leaves home early in the morning to catch a silver fish at the local park, the following is described: ‘No one about. She had the world to herself, and the pink-and-white hawthorn blossom was thick on the trees and the laburnum dangled tassels of gold. Here was quiet pool under a tree. Just the place where a silver fish might be! She lay down on the grass and peered into the water. The ends of her hair slid into the pool, her breath ruffled its surface. What a strange was there under the water, green moss, spread in waving patterns, silver bubbles coming up from nowhere, and under the roots of the tree, dim caves…’. Young Anne is an accomplished debut, and as Mangan points out, Whipple’s wonderful writing and ‘unmistakeable voice’ are already prominent throughout. Young Anne is a heartfelt, searching, and introspective character study. Anne comes up against many hurdles in her life, and Whipple seems concerned, above all, with how she deals with, or overcomes, them. As all of Whipple’s later novels can contest, Young Anne is poignant and thoughtful, shrewd and intelligent. I became absorbed within the story immediately, and found the character arc which Whipple has so deftly crafted eminently believable. The human condition is centre stage here, and rightly so; Whipple has much to say about the difficulties of growing up, and so much compassion for its consequences. I am currently trying to stop adding books to my extensive to-read lists, but I could not resist sneaking a peek into a few book lists which detail 2018 releases. With this in mind, I have made a list of ten which I will be seeking out over the course of the year. My eighth, ninth and tenth books on this list are the forthcoming Persephone publications for April 2018. I can find little information about any of them as yet, but I am very excited to read Despised and Rejected by Rose Allatini, Young Anne by Dorothy Whipple, and Tory Heaven by Marghanita Laski. Which books are you most excited about during 2018? Will you, or have you, read any of these? After a few not very good and rather disappointing reads, I really felt in the mood for a Persephone. I adore the books which they publish, and for me, they are one of the most important publishing houses which exists today. Dorothy Whipple is an author who seems to be one of the most adored on the Persephone list, and I was eager to begin another of her novels. Someone at a Distance was first published in 1953. Someone at a Distance is introduced by Nina Bawden, an author whose work I very much enjoy. 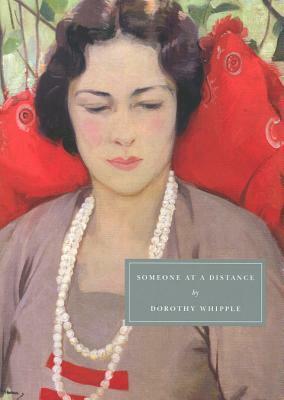 She writes of how much she admires Whipple’s work, and says this about the novel: ‘[it] is, on the face of it, a fairly ordinary tale of a deceived wife and a foolish husband in rural suburbia not far from London and, perhaps because the author was nearing sixty when she wrote it, there is a slight pre-war flavour about the domestic expectations of the characters’. Bawden goes on to say that ‘Whipple is a storyteller in the straightforward tradition of J.B. Priestley and Arnold Bennett rather than Virginia Woolf or Elizabeth Bowen’. As with a lot of the books on the Persephone list, Someone at a Distance is a familial novel. Avery North, son of the formidable matriarch, is a publisher. Ellen, his wife, is focused upon, and she is one of the most realistic constructs whom I have come across in fiction in such a long time: ‘Guiltily, pleasurably, she avoided the parties Bennett and North gave for authors, agents and the like… everybody talked vociferously, and though here and there people moved aside, smiling, to let her pass, nobody interrupted conversation for her. Slight, fair, with no idea at all of trying to make an impression, she didn’t look important and nobody wondered who she was’. Whipple exemplifies the changing times within society marvellously: ‘Maids had disappeared from the domestic scene long ago… Ellen now did as her neighbours did and employed day, or, more properly, half-day, women’. We learn both about the North family, and headstrong Louise Lanier, as she finds her feet. Whipple’s description of her is vivid from the very first: ‘Her lips were made up, even for breakfast, in a magenta colour, which nevertheless matched the varnish on the nails of her narrow hands… What was remarkable about her, the offspring of two large, baggy parents, was her clear-cut, almost exquisite finish… Yes, she could look after herself. She was far from ordinary’. ‘Straightforward’ Whipple’s prose may be, but one is drawn in immediately. Some of the turns of phrase which she crafts are beautiful: ‘Wisteria toppled over a high garden wall in dusty mauve cascades’. This is, quite honestly, a stunning novel, and one of the best books which I have read in a long while. As an author, Whipple has an incredible amount to offer; her books provide a marvellously restful solace in our hectic world. We begin this edition of The Book Trail with one of my favourite reads of late, Elizabeth Jenkins’ depiction of a real Victorian murder case, Harriet. As ever, I have used the ‘Readers Also Enjoyed…’ feature on Goodreads to compile this list. Harriet is a Persephone publication; each of the recommended reads on its page, as well as pages for following books, is also published by the same wonderful press. Which of these books have you read? Have any of them piqued your interest? Which is your favourite Persephone publication? I am posting another book trail today, to see where we can get from the starting point of Dorothy Whipple. Who thought we would start with a wonderful novel about England and end up in Russia and the Baltic? As ever, if you have enjoyed this and wish to suggest a starting point for the next Literary Trail, please do! Skimming through my extensive to-read lists, I notice that there an awful lot of books by authors named Dorothy. I thought that I would profile a couple of the lesser-known books by three different – and equally wonderful – Dorothies; Miss Baker, Miss Whipple, and my beloved Miss Richardson. Whilst a handful of their books have been reissued by the likes of NYRB and Persephone, many are still sadly out of print, and rather difficult to get hold of. Still, the following are the ones which I am coveting! A comprehensive and intriguing review can be found at A Penguin a Week, here. A fascinating review of this, and Persephone’s choice to reprint, can be found at BooksSnob’s blog. BooksSnob has also reviewed this novel, which you can see here. Have you read any of these? Which are your favourite books by Dorothies?